Not to be confused with Bideford, Devon. Motto: "A Proud City Rising Where the Water Falls"
Biddeford is a principal population center of the Portland-South Portland-Biddeford metropolitan statistical area. Abenaki Indians, whose main village was upriver at Pequawket (now Fryeburg), once hunted and fished in the area. The first European to settle at Biddeford was physician Richard Vines in the winter of 1616-17 at Winter Harbor, as he called Biddeford Pool. This 1616 landing by a European predates the Mayflower landing in Plymouth, Massachusetts, (located 100 miles to the south) by approximately four years, a fact that is overlooked in much of New England lore. In 1630, the Plymouth Company granted the land south of the River Swanckadocke to Dr. Vines and John Oldham. In 1653, the town included both sides of the river, and was incorporated by the Massachusetts General Court as Saco. Roger Spencer was granted the right in 1653 to build the first sawmill. 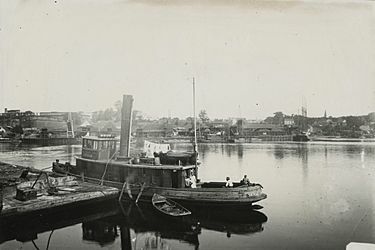 Lumber and fish became the community's chief exports. In 1659, Major William Phillips of Boston became a proprietor, and constructed a garrison and mill at the falls. During King Philip's War in 1675, the town was attacked by Indians. Settlers withdrew to Winter Harbor for safety, and their homes and mills upriver at the falls were burned. In 1693, a stone fort was built a short distance below the falls, but it was captured by the Indians in 1703, when 11 colonists were killed and 24 taken captive to Canada. In 1688, Fort Mary was built near the entrance to Biddeford Pool. 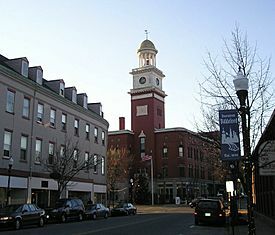 The town was reorganized in 1718 as Biddeford, after Bideford, a town in Devon, England, from which some settlers had emigrated. After the Fall of Quebec in 1759, hostilities with the natives ceased. In 1762, the land northeast of the river was set off as Pepperellborough, which in 1805 was renamed Saco. The first bridge to Saco was built in 1767. The river divides into two falls that drop 40 feet (12 m), providing water power for mills. Factories were established to make boots and shoes. The developing mill town also had granite quarries and brickyards, in addition to lumber and grain mills. 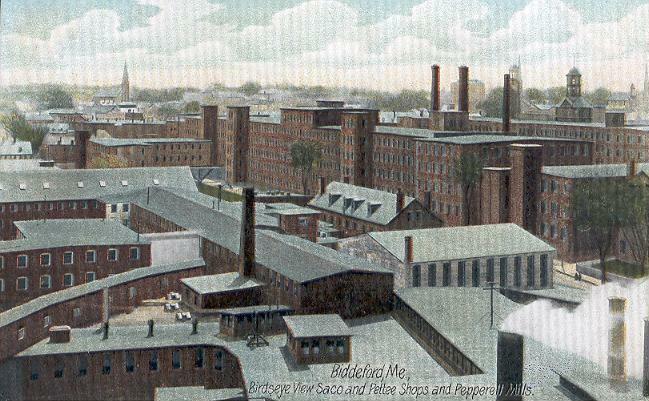 Major textile manufacturing facilities were constructed along the riverbanks, including the Laconia Company in 1845, and the Pepperell Company in 1850. 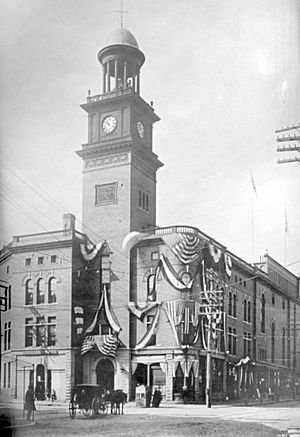 Biddeford was incorporated as a city in 1855. The mills attracted waves of immigrants, including the Irish, Albanians, and French-Canadians from the province of Quebec. At one time the textile mills employed as many as 12,000 people, but as happened elsewhere, the industry entered a long period of decline. As of 2009, the last remaining textile company in the city, WestPoint Home, closed. The property occupying the mill has been sold and is being redeveloped into housing and new businesses. The last log drive down the Saco River was in 1943, with the last log sawn in 1948. 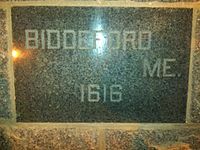 Biddeford's name is engraved near the top level of The Pilgrim Monument, in Provincetown, Massachusetts, along with the names of some of the oldest cities and towns in New England. During World War II the Biddeford Pool Military Reservation was established from 1942 to 1945, on what is now the Abenakee Golf Club. It had four circular concrete platforms called "Panama mounts" for 155 mm guns, three of which remain today. Biddeford is located at (43.474111, -70.446157). According to the United States Census Bureau, the city has a total area of 59.08 square miles (153.02 km2), of which 30.09 square miles (77.93 km2) is land and 28.99 square miles (75.08 km2) is water. Situated beside Saco Bay on the Gulf of Maine, Biddeford is drained by the Little River and the Saco River. The city proper has very diverse geography, from inland rolling hillside, to urban settlement, to coastal sprawl. The city is crossed by Interstate 95, U. S. Route 1, and state routes 5, 9, 111, and 208. It is bordered by the city of Saco to the north, the Atlantic Ocean to the east, the towns of Dayton and Lyman to the west, and the towns of Kennebunkport and Arundel to the south. The Little River forms a portion of the border between Biddeford and the Goose Rocks neighborhood of Kennebunkport, in Biddeford's most southerly region (Granite Point). East Point, located on the peninsula of Biddeford Pool, is the easternmost point in York County. Timber Island, the most southerly point in the City of Biddeford, lies in Goosefare Bay at the mouth of the Little River, and is accessible at low tide from Goose Rocks Beach in Kennebunkport. The island and most of adjacent Timber Point became part of the Rachel Carson National Wildlife Refuge in December 2011. The city has almost 15 miles (24 km) of frontage along the Saco River, and an Atlantic coastline on which the seaside neighborhoods of Hills Beach, Biddeford Pool, Fortunes Rocks and Granite Point are located. Biddeford includes Wood Island Light, a lighthouse located about a mile offshore from Biddeford Pool. While Maine (as a whole) is politically and colloquially known as part of Northern New England, Biddeford's geography technically places it more in line with Central New England. This climatic region is typified by large seasonal temperature differences, with warm to hot (and often humid) summers and cold (sometimes severely cold) winters. According to the Köppen Climate Classification system, Biddeford has a humid continental climate, abbreviated "Dfb" on climate maps. At the 2010 census, there were 21,277 people, 8,598 households and 4,972 families residing in the city. The population density was 707.1 inhabitants per square mile (273.0/km2). There were 10,064 housing units at an average density of 334.5 per square mile (129.2/km2). The racial makeup of the city was 97.8% White, 1.0% African American, 0.5% Native American, 1.7% Asian, 0.4% from other races, and 1.6% from two or more races. Hispanic or Latino of any race were 1.7% of the population. There were 8,598 households of which 27.3% had children under the age of 18 living with them, 40.4% were married couples living together, 12.3% had a female householder with no husband present, 5.1% had a male householder with no wife present, and 42.2% were non-families. 30.0% of all households were made up of individuals and 11.1% had someone living alone who was 65 years of age or older. The average household size was 2.30 and the average family size was 2.84. The median age in the city was 38.3 years. 18.7% of residents were under the age of 18; 15.4% were between the ages of 18 and 24; 24.3% were from 25 to 44; 26.1% were from 45 to 64; and 15.3% were 65 years of age or older. The gender makeup of the city was 47.5% male and 52.5% female. At the 2000 census, there were 20,942 people, 8,636 households and 5,259 families residing in the city. The population density was 697.8 per square mile (269.4/km²). There were 9,631 housing units at an average density of 320.9 per square mile (123.9/km²). The racial makeup of the city was 96.65 percent White, 0.64 percent African American, 0.40 percent Native American, 0.99 percent Asian, 0.03 percent Pacific Islander, 0.18 percent from other races, and 1.12 percent from two or more races. Hispanic or Latino of any race were 0.65 percent of the population. There were 7,636 households of which 28.4 percent had children under the age of 18 living with them, 44.4 percent were married couples living together, 12.2 percent had a female householder with no husband present, and 39.1 percent were non-families. 29.7 percent of all households were made up of individuals and 11.1 percent had someone living alone who was 65 years of age or older. The average household size was 2.32 and the average family size was 2.88. 22.1 percent of the population were under the age of 18, 11.1 percent from 18 to 24, 29.5 percent from 25 to 44, 21.8 percent from 45 to 64, and 15.5 percent who were 65 years of age or older. The median age was 36 years. For every 100 females there were 88.2 males. For every 100 females age 18 and over, there were 84.4 males. The median household income was $37,164 and the median family income was $44,109. Males had a median income of $32,008 versus $24,715 for females. The per capita income for the city was $18,214. About 8.6 percent of families and 13.8 percent of the population were below the poverty line, including 19.8 percent of those under age 18 and 10.3 percent of those age 65 or over. Anchoring Biddeford's historic downtown are McArthur Public Library and Biddeford's City Theater. 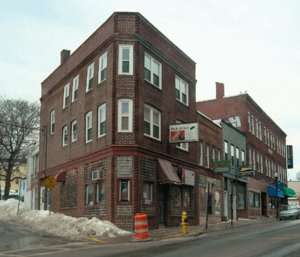 Biddeford has a number of properties and two Historic Districts entered into the National Register of Historic Places. The newest addition is the Main Street Historic District, entered into the National Register on December 24, 2009. 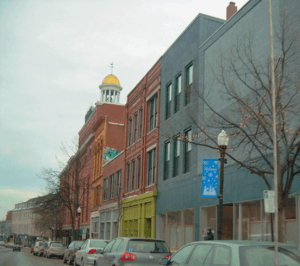 Other downtown National Register properties include the Biddeford-Saco Mills Historic District, Biddeford City Hall, Dudley Block and the U.S. Post Office. National Register properties outside of downtown and in the Biddeford Pool area include the John Tarr House, First Parish Meetinghouse, Fletcher's Neck Lifesaving Station and the James Montgomery Flagg House. The first part of Black Mirror II, a 2009 PC adventure game developed by Cranberry Production, takes place in Biddeford. Biddeford, Maine Facts for Kids. Kiddle Encyclopedia.